Big Lots, the massive retailer with more than 1,400+ locations, can be considered to be a discount chain known for its closeout buys, almost always selling random name-brand items at a low, low price. Honestly, I think you can find just about anything here, from furniture to fireplaces and even gazebos. And if you’re a fan of the store, you don’t want to head to the store just yet as I wanted to share some great tips you can use on your next shopping trip to really maximize your savings. The BIG Rewards! (formerly known as the Buzz Club) is 100% free and you should consider joining it for a few reasons. 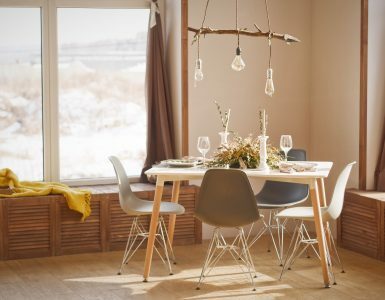 For one, the retailer will give you a $5 reward for every three purchases you make and even a $10 bonus for every $200 you spend on furniture. This is a no-brainer if you’re going to spend money there anyway. Just think of it: If you bought a $600 couch, that could net you an extra $30 in your pocket just for joining! 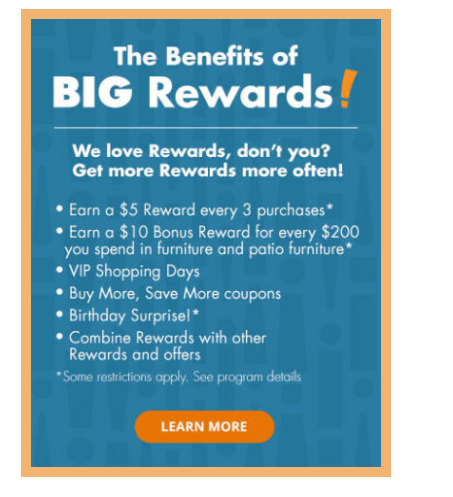 Not only can you receive a $5 or a $10 reward just for shopping as you normally would, but Big Lots will also invite you to VIP shopping days (known as Friends and Family days), send you unique coupons, such as the popular 20% off, and even a birthday surprise! 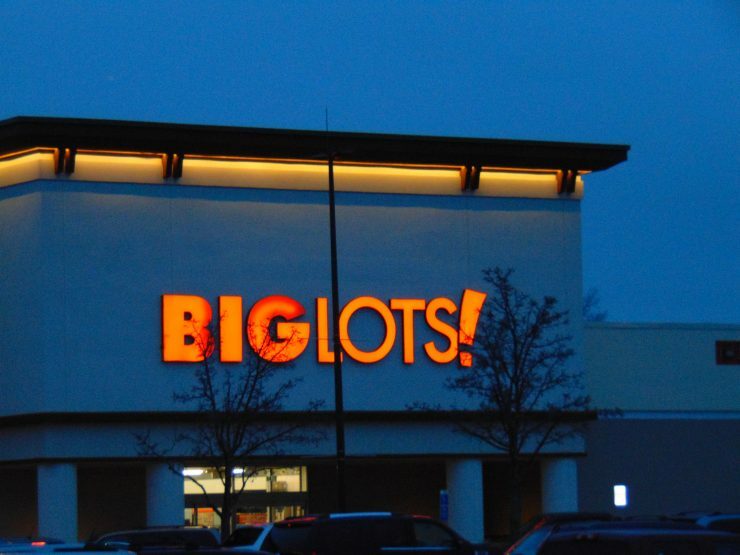 What is the Big Lots birthday surprise, you may be wondering? Well, when I signed up, the retailer sent me a 15% off my entire purchase, including furniture. And this will be sent out during the first week of your birthday month, so make sure you sign up before your birthday month to get your 15% off birthday coupon. Again, signing up is 100% free and you can do so via the official website here. You can also read more about the program in depth here via the company’s official FAQ page. Even if you do not shop here often, sign up just in case you do find yourself inside the store. If you plan on shopping online, and yes, Big Lots does have quite the selection, you can get 2% cash back online or 1% cash back on your purchase simply by using eBates. This percentage does change, though, so be sure to check it out. And if you’re unfamiliar with eBates, it’s extremely easy to use and 100% free to use. Just sign up, find a store you want to shop with, click the special link on your dashboard and shop like you normally would. Then, when you complete your purchase and eBates confirms it, you will get the 2% back on your eBates dashboard. This strategy works with 1,000s of retailers as well! If you haven’t signed up, the company is always offering a $5 or $10 bonus just for making your first purchase, so if you plan on making any purchases online, I highly recommend you bookmark the website for future purchases. Aside from the online purchases, you can get in-store cashback as well. To get it, you just need to link your credit card on eBates and that’s it. Then, when you make a purchase at a qualified retailer, the company will add the cash back to your dashboard — it’s that simple, I promise. Raise is an awesome and very reputable resource that allows you to purchase a gift card for just about any retailer, including Big Lots, for a discounted price. And while Big Lots gift cards go fast, I have seen them discounted for as much as 12% off. If you’re thinking about making a purchase anyways, buy the gift card and use it in store or even online as you would with your regular purchase. If you do decide to purchase and use it, you can stack your coupons since the store views the gift card like a cash/credit card purchase and has no idea how you purchased it, allowing you to really maximize your savings. Be sure to compare all of these to see where you can maxmize your savings. Plus, it’s a great way to keep in the loop to know when their famous 20% off sales are happening. Even if you’re part of their club, it doesn’t hurt to follow them just to stay in the loop. One of the main reasons shoppers often shop at Big Lots is often due to the great clearance section, which is available both online and in store. 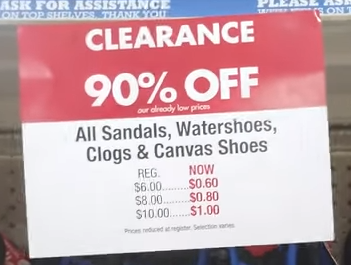 If you want to shop in store, the clearance is often held in the back of the store, but honestly, some stores will have clearance laying all over the place. And if you’re able to find it, you find everything and anything ranging anywhere from 40 to as much as 90% off. As for the online store, Big Lots also has a clearance section, but when I checked it wasn’t as good as in the store, but you can still check it out to see if you can find something of interest. Compared to the store, the selection may be greater, but if you don’t meet the minimum spending requirement, you will have to spend at least $99 to receive free shipping. Other than that, it’s often around $5 to ship an order. I recommend checking them out both, especially after big holidays and when the seasons end, to see if you can find anything good. Touching upon my last sentence there, Big Lots is notorious for offering some pretty good deals when the winter, spring, summer and fall months come to end. Generally, the last month of the season is usually when you can find the best deals, with prices up to 70% off in some cases. For example, after Christmas, usually the day after, you can find Christmas trees, ornaments and decorations for 50% off, whereas in the summer months, usually around September, you can find swimming pools, pool toys, a gazebo and even patio furniture for up to 70% off. Wait even longer and the store will continue to mark items down, sometimes to the tune of 90% off. If you’re in the hunt for a particular seasonal item and don’t mind waiting until the season/holiday ends, then I would highly wait until either day after the holiday or the last month of the season to score some pretty good deals. Touching upon the clearance section, I also wanted to point out that most Big Lots have a clearance food section, which often includes name-brand items. From chips to baked goods, the items will often expire within a few weeks, but if you plan on consuming them fast, you can score some pretty good deals. To find the clearance rack, again, look for the large red sign and explore near the food section within the store. This will be a hit or miss. Some stores will throw all of its food in a cart and slap a clearnace tag on it. However, if you plan on purchasing food, pay close attention to the expiration date as some shoppers have reported some food on the shelves being very close to the expiration date. Inside the store, if you’re able to spot a price tag that has a red price tag, similar to the picture below, then this is a unique only and is marked down for a variety of reasons. Usually, if you pay close attention to the price tag, it will tell you exactly why it’s being marked down. Nonetheless, the item will still work as is, but it will have some sort of flaw, hence, the price drop. This can be like a scavenger hunt and the items will always be at random since it’s up to the individual store to mark the item with this special tag. Again, this is a “this item only,” simply meaning that is the ONLY item with that special deal. Via the official website, make it a habit to scan the weekly ad just to see if anything is of interest and/or to see if any special promotions/coupons are available for the week. By far, this is the easiest way to spot a deal or even see if a special sale will be held during the ad week. For example, when I was writing this, the store was giving 11% off on your entire purchase to all veterans on veterans day. Whether it’s the Black Friday ad or a special toy catalog for the upcoming Christmas season, the retailer will release an ad once a week. About three to five weekends a year, Big Lots will have a “20% off everything” day, and the event is open to everyone, but some events, such as the “Friends and Family,” will only be open to those who sign up for the e-mail club. While you won’t find a list of these 20% off dates online, members as part of the e-mail club, as mentioned earlier, will get notified before the public does. And if you’re not a member, that’s okay, too, as you can check the weekly ad or follow the company on social to stay in the loop. But honestly, it’s best to just sign up for the free e-mail club so that you don’t have to worry about constantly checking. It’s free after all! How often does Big Lots send out a 20% off coupon? From what I read, it appears Big Lots will send out a 20% off coupon and/or have the event about three to four times a year, usually every quarter. For example, if you look at the Google Trends chart below for 2018, you can see exactly when people were searching for the 20% off coupon more than usual, which was about two times so far. 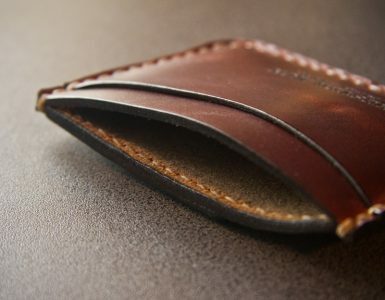 Again, if you’re interested in the 20%, follow most of the tips on this page to stay in the loop as the retailer does a good job letting you know when you can save the 20%. 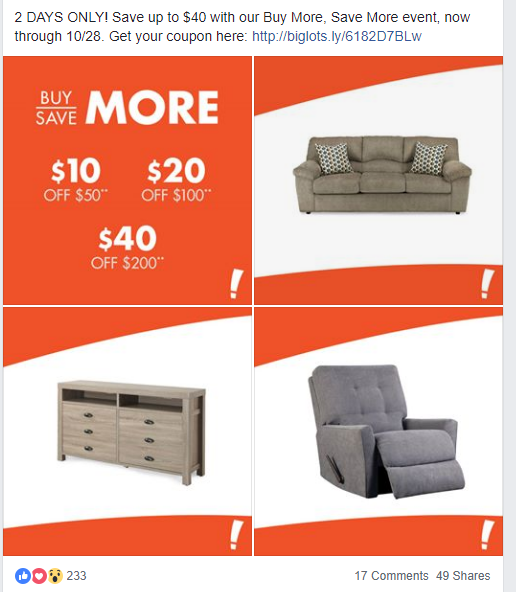 The official Big Lots website has an official coupon page, in which they list the most current offerings. Here, you can visit the weekly ad, join the BIG Rewards or sign in to your account to see if any deals are available. As you can see from my screenshot, they didn’t have any coupons available. Also, if a 20% off sale is coming up and you do not want to join the rewards program, then you can find out when it’s happening if one is coming soon. Just click the offer to download and bring it to the store to take advantage. Just about all of the merchandise in the store is brand new, but did you know the store sells refurbished merchandise? For instance, some shoppers often see refurbished vacuum cleaners or even small appliances. And if you’re able to spot one, the prices are often 50%+ off of the new retail price. To know if it’s truly a refurbished, just look for the refurbished tag that’s usually predominately displayed on the packaging. Honestly, it’s very easy to spot and these refurbished items can be just as good as the new items! Inside of the store, be sure to be on the lookout for any pallets, commonly found near the end caps, to see what kind of deals you can take advantage of. According to employees, these pallets are often filled with one-time closeout deals, promotions and items heavily discounted and are of great value. Sometimes, you can get a fairly good idea as to what may be on the pallets based on the weekly ad, but in some cases, the pallets may be at random, offering you a nice surprise. If it’s on a pallet, it’s more than likely a great deal, period. Most people do not know about this little trick, but if you search eBay for Big Lots coupons, you can often find something that you may be able to take advantage of. And the price of the coupon is often less than $1 and will arrive at your door within the next few days. See my screenshot below. While you won’t always find a coupon, search on eBay to see if you can find anything of value. 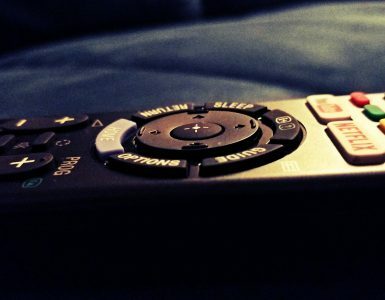 You may be able to find someone who wants to get rid of their gif tcard. For example, when I was searching while writing this, I found a 20% off coupon, but your results will vary. While Big Lots does sell a lot of big-name items in the grocery aisle, the store DOES NOT accept manufacturer coupons. And while the company does sell K-cups, toilet paper and many of the other items you can find at a local grocery store, be sure to match the prices elsewhere to assure you’re getting a great deal. However, as the company continues to send out coupons in the mail, they will accept their own branded coupons, that’s about it. According to the company’s “Price Promise,” Big Lots WILL match the price as long as you can show proof and the item is identical and in stock by the competitor the day you request the match. However, as with most price matching policies, exceptions do apply. 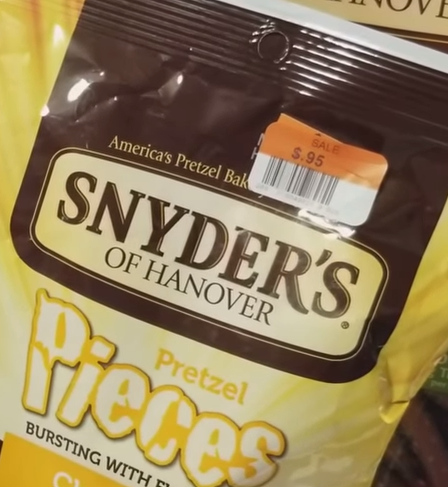 They are not able to match special promotional prices for online purchase are not able to match prices for stores that do not have a local store, such as Amazon.com and Overstock. In the end, if you want to price match, it has to be a fairly straightforward price from a local competitor for the SAME item. This is not a full list of all exclusions, so I encourage you to visit the price matching page for more information as to how the company’s “Price Promise” works. You can also talk with a store associate as well for more information. According to the price promise page mentioned prior, you can request a price adjustment for up to 30 days after your purchase. Just like the price match, to request a price match after your purchase, you need to bring in a local brick-and-mortar ad and your Big Lots receipt. And as long as it meets the criteria, they will give you back the difference. I would only recommend the 30-day price match if you purchased a larger item. Just check the weekly ad every week for the next month or so to make sure the item you purchased didn’t drop in price. The Big Lots return policy is pretty simple and straightforward. If you’re not satisfied with your purchase, just bring it back to the store with a receipt and the original packaging. You will have 30 days to do so. As long as it is in its original packaging and condition, you shouldn’t have a problem getting your money back. However, some rules and restrictions do apply, as with any return policy, which you can view on BigLots.com. As long as you received a receipt for your purchase, don’t forget to take the survey on the bottom. In doing so, the retailer will often enter you into a gift card sweepstakes or offer some sort of incentive. 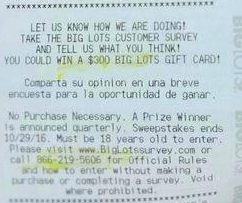 For example, when I shopped, I could win a $300 gift card just by taking the survey based on my receipt. Now, this isn’t always the case, but it doesn’t hurt to check out the bottom of your receipt to potentially win. What do you have to lose? In comparison to most online retailers, you need to spend at least $99 in order to get free shipping on BigLots.com. And in the case of furniture, Big Lots partners with FedEx, offering to ship the furniture for $149. Any furniture you purchase at Big Lots, whether it’s a recliner, outdoor furniture, couch or an end table, will require no assembly. So if you see something you like in the store and it’s on display, you won’t have to worry about whipping out the screwdriver and spending your afternoon putting it together. And if you don’t have the room in your car to take it home, Big Lots will deliver for about $149 from what I was told. Based on the multiple reviews I read online, it appeared the Big Lots credit card, offered by Comenity, isn’t worth it if you’re thinking about signing up. The card rarely offers signup deals, and it appears you don’t receive any points whenever you spend, one of the main reasons I wouldn’t recommend it. While one perk states that you can receive “special member offers,” it seems as if you can do just as well with the free e-mail club I mentioned in the beginning. With no points per dollar, no bonuses and no perks for that matter, there are many more credit cards I would consider before signing up for this one. With this program, no credit is needed and filling out an application only takes a few minutes, and the final results are based on your income and current employment. If approved, then you can spread out your payments for 90 days. To learn more about the program, you can visit the official progressive leasing page here. According to the official BigLots.com FAQ, the company no longer has a layaway program. To take advantage, the retailer will ask for a 10% deposit and then, Big Lots will hold the item for 90 days. This seems to vary, however. As long as you come back within the 90 days, you can buy the furniture item for the same price when you placed your 10% deposit. Be sure to call the store ahead of time to confirm this if interested as the rules will vary. As you can see there are a lot of GREAT ways to save at Big Lots, and if I had to shop there and maximize my savings, here’s what I would do. For starters, I would always look at the discounted gift card websites, with Raise and Cardpool being my favorite. This right here could save me about 7%. Next, I would be patient and wait for the 20% off Saturday or Sunday. Trust me, they will have one of these sales at least once a quarter, so if you can wait, it’s worth the 20% in savings. 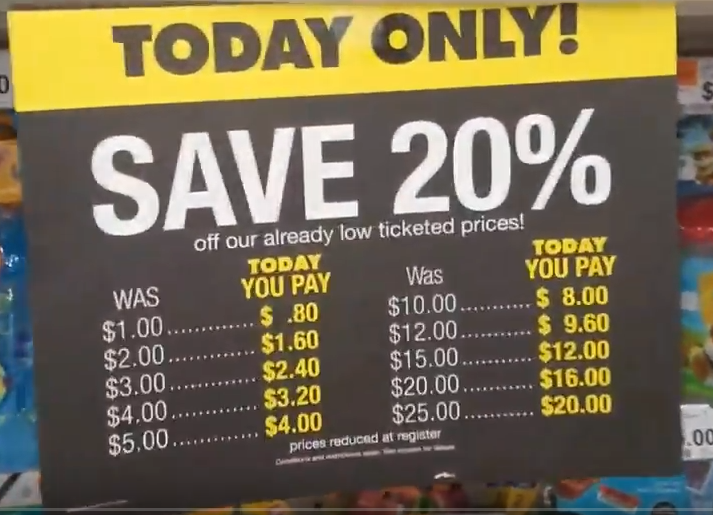 Then, once the 20% day rolls around, I would take advantage of the clearance-based items and/or anything that’s really worth the 20%+ on my purchase. So to put in perspective, if I bought a $100 gift card for $93 (after 7% off) and bought $100 worth of stuff before the 20%, my grand total would be $80 plus tax. Using the gift card, I would essentially save another 7%, making my grand total $73 for $100 worth of items. Now, if you can’t wait until the 20% off day, that’s fine, too, as there are other ways to save. For one, clearance items will always be laying around the store, so be sure to go up and down the aisles to spot them. Also, if it’s right after a major holiday, be sure to look for any seasonal items if you need them as you can sometimes save up to 90%. And lastly, DON’T forget about the birthday coupon. If you sign up and get your 15% off, be sure to use it with a discounted gift card to really maximize your savings. 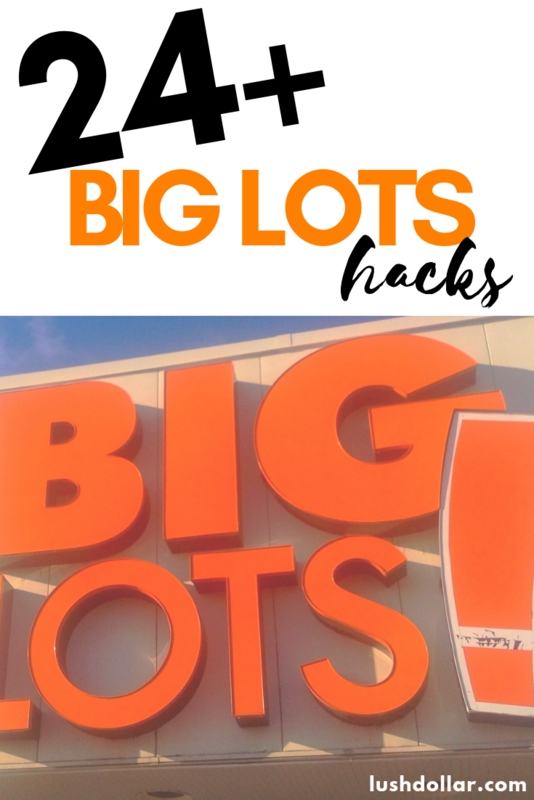 For now, I think I talked about the various “hacks” and ways to save at Big Lots. If I missed any ways to save at Big Lots, do let me know. I’d love to hear about them!